My quilts, my sock (and sometimes other things) knitting, my other crafty-ness, my kids, my shopping obsession, my job, ... All rolled up in one happy blog! 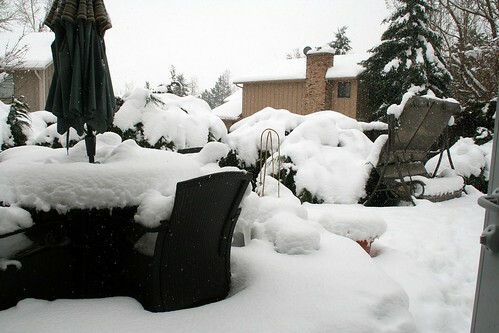 But it was my favorite sort of snow- CO spring snow! Here today, gone tomorrow. Basically, we got a fabulous Saturday Snow Day in the house- I sewed, the kids did crafts and watched a movie, and The Hubby chilled when not helping with said crafts. And then, it all melted away, leaving us with temps near 80 degrees by today! Before the weather got so darn gorgeous, I did take advantage of that snow day, as I mentioned. 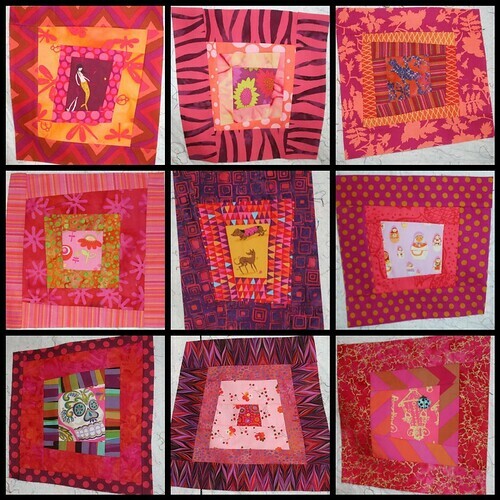 More pink/purple/orange blocks! But what is fabric for if not to be used and enjoyed, right? Now I need to get of my bum and baste and quilt these last two tops. Both are for babies not yet here, but, they will be eventually. And I have one more to go. 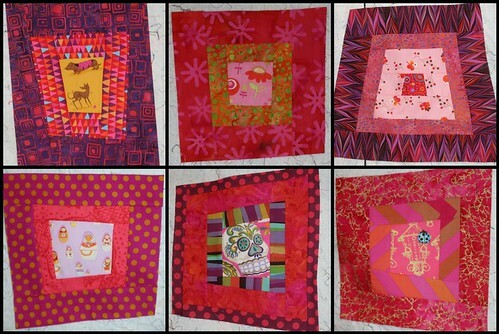 I also finally finished the 2 blocks for Jacquie's Project Improv auction quilts. They are *finally*getting mailed tomorrow, I swear! And then, after we survive Annie's big 8th birthday on Thurs and our first time ever hosting a slumber party on Sat., I'll move on to another Project Improv piece. Deb wanted an update on my new fabric organization system, and if it has helped shake me out of my rut. I'm awfully pleased with this! I let loose and worked on two of my biggest issues- 1) the matchy matchy fabric and 2) hoarding my faves. See all those recognizable designer pieces in there? I was really careful to try and avoid more than 2 of any one line. And see some of my faves in there? I cut pieces out of fabrics I have been hoarding for ages. And you know what? It felt GREAT. Having the fabrics sorted by nothing other than color really did help me- I pulled anything I liked, regardless of what category I might have put it in before. My focus fabric is that Heather Ross matryoshka. It has such great colors in it, and is so adorable. Everything else built around it. 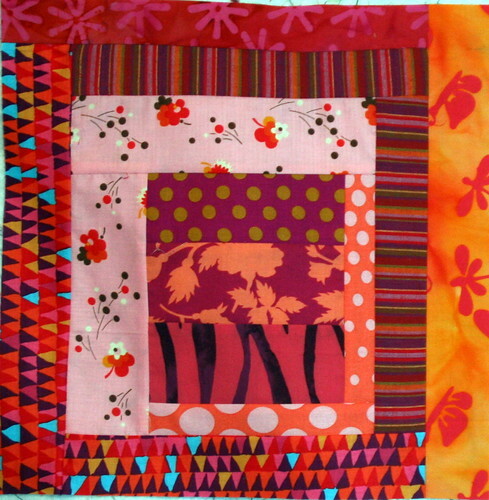 And by the way, did you happen to notice that I managed to make my pink and orange quilt into a pink and orange AND purple quilt? It's a gift, I tell you. So here's where I'm going with these: 9 improvisationally pieced blocks of varying sizes, to be finished off in white on white, and put together w/white on white outer border, then REALLY bold binding. I whipped out 6 blocks last night while watching the first 3 episodes of Buffy on Hulu. I would have gone on longer, but I really needed to sleep. As soon as I finish our taxes tonight, I'll make more. And more. And more! Mwah-ha-ha-ha-ha! No sewing at home this week because... I thought I would follow through on my idea to totally reorganize my fabric! I'm almost done. There was a little more work entailed in this project than I realized when I started. But I have boldly and bravely mixed everything in by color- batiks, novelties, designer lines, whatever. Now instead of the previous arrangement of segregated shelves, there's the green shelf. The blue shelf. The pink shelf... You get the idea, right? I'll post a photo when I'm all the way done. I crapped out on purple. As you might guess, I have a lot of purple. 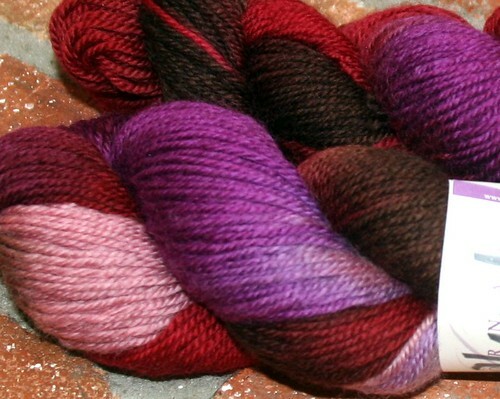 In fact, 70% of the batiks seem to be purple. When I get some more energy, I'll tackle it! So I can't show you any sewing but I can show you two scarves I've knitted lately. One was a super long and drawn out project- a pick-up-put-down type of thing. I started it right before we went to Boston last summer, and got bored very quickly- it felt like I was making NO progress. I would work on it between socks, or if I needed something really mindless. I brought it to knitting class at work, and the women who participate have really enjoyed giving me good-natured grief over it. 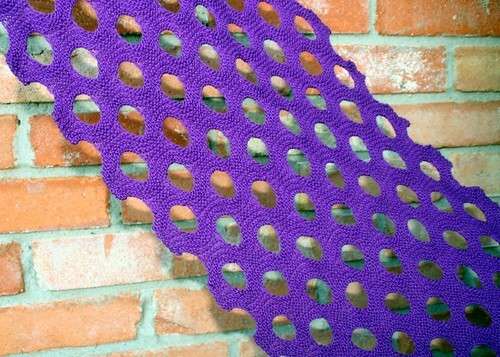 It's a very very cool pattern, and the finished effect is stunning. But be warned- it is repetitive to work on. Well, tease me no more! 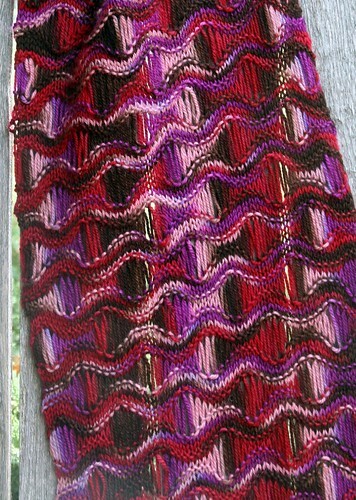 The never-ending scarf is done, blocked and all! I do love how it came out. Now, to figure out how and where to wear it. and cast on a pattern that I had long admired (rav link). And in just about 2 weeks, voila! 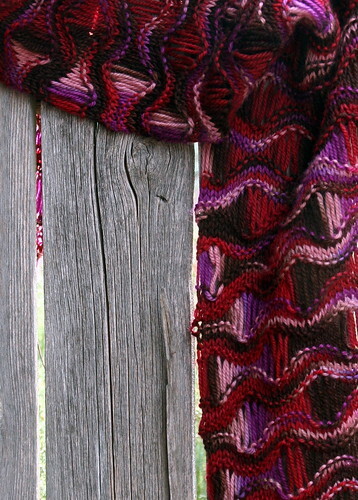 I really love the effect of this pattern with the variegated yarns! 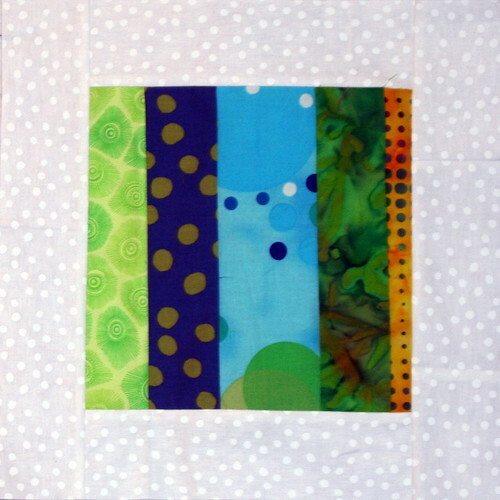 Meanwhile, I'm off to quilt group tonight, where i will connect with the fabulous Karen and retrieve 2 quilted quilts! The slightly naughty B&W of last year, and my folks' ridiculously delayed Xmas gift. 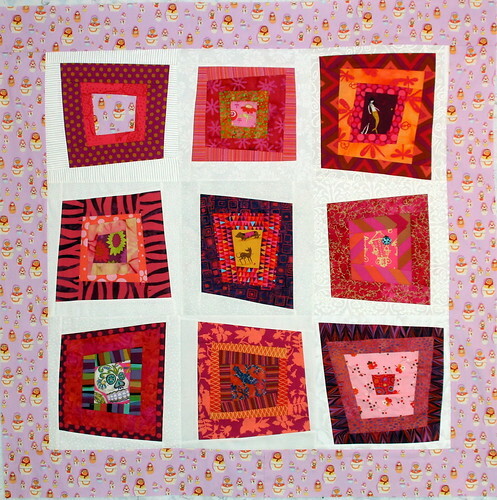 Quilt for a cause: can YOU help? Hi lovely readers. Below you will find some information on an incredible fundraiser being organized by an incredible woman and veteran, who also just happens to be an incredible quilter. If you can help out in any way, know that it is a fabulous cause! Please spread the word! For a little over a year Juliet Madsen has been on a mission. After becoming one of the thousands of American military members who have been medically evacuated from Iraq or Afghanistan, Juliet decided to take her life back and make it count. In 2004 Juliet sustained injuries that damaged her kidneys, heart, and brain resulting in a stroke which left her with tremors, left sided weakness, migraines, difficulty walking and talking as well as severe Post Traumatic Stress Disorder. After extensive physical and vocational rehabilitation she has made it her goal to give back to the Care Givers of the Veterans Administration and the veterans she encounters at the VA hospital. as many veterans as possible and in a way that I could really make a difference,” Juliet said. On September 27, 2008 Juliet rented the Colorado History Museum and hosted the first annual Ultimate Sew-In where 50 quilters and volunteers got together to create as many quilt tops as possible to be donated to evacuating troops in U. S. military hospitals in Germany; where Juliet was herself a patient. All of the completed quilts will be auctioned off on September 4, 2009 at DU’s Phipps Tennis Pavilion during a cocktail party from 5:30-9:30 p.m.
As a tax exempt non-profit fundraising program we would like to ask for your support through a financial donation. Currently we need financial backing so that we can pre-pay the set-up, location, and all that the Auction will need. For more information please visit www.strokeofluckquilting.com or contact Juliet Madsen at juliet@strokeofluckquilting.com. Thank you for your support; together no one will be left behind. I'm a quilter, knitter, professional fundraiser, bleeding heart liberal, thrifter, mother and wife. On Wordless Wednesday: It's here!